Shop MAKROLON® VR Flexible Marine Polycarbonate for extreme conditions in marine applications. 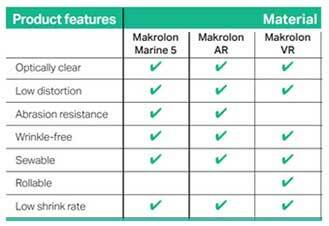 Shop MAKROLON® Marine 5 (M5) Flexible Marine Polycarbonate for the same benefits as Makrolon VR with added protection against abrasion. Marine high density polyethylene (HDPE) plastics including lightweight and extremely tough King Starboard®, provide a flat environmentally stabilized sheet that is able to storm the harshest weather conditions and stand up to any marine environment. High sliding resistance alongside excellent long-term durability make marine HDPE ideal for a variety of applications on boats including replacing wood, metal or laminate walkways, hatches, walkways, cabinets and counter tops as well as ship and boat components regularly exposed to harsh outdoor environments. King StarBoard® has a decorative, textured surface that does not show wear, dirt or scratches. HDPE marine plastics are lightweight extremely tough, and chemically resistant. It does not absorb water and has a good sliding abrasion and unlike many other marine-based materials, our top of the line King StarBoard® is environmentally stabilized to resist salt water, and will not rot or degrade. Utility and XL marine grade high density polyethylene (HDPE) plastics offer a lightweight and economical alternative to our standard grades of Marine Board, by incorporating a nonabsorbent closed small cell structured core versus a solid core. This alternative grade of marine HDPE is perfect for when the material's cut edges won't be visible and other "behind-the-scenes" applications. Utility grade marine HDPE is up to 35% lighter than a solid core HDPE and it offers the same quality textured surface on both sides. Our lightweight marine HDPE is specially formulated to withstand the rigors of harsh outdoor marine environments and is UV-stabilized to resist damage and retain its beauty, even after years of direct sunlight. Utility grade marine board features an economical HDPE regrind which may expose visual imperfections on the surface of the sheet. For this reason, utility grade marine HDPE is commonly used where it will not be seen; for example, for marine seating that will be covered in cushion material. Utility XL grade marine board uses the same cell structure core as utility grade, but is made from virgin HDPE for a clean finish for exposed surfaces. Expanded PVC is a lightweight "foamed" marine plastic able to withstand moisture, resist rot and warpage, and delamination that often occurs with wood. Marine PVC is easy to fabricate with traditional woodworking tools, and extremely versatile for ease of forming, cutting, gluing, screwing, nailing, and even stapling. Although lightweight, expanded or "foamed" PVC has an incredibly high strength-to-weight ratio that won't swell, peel or deform over time, but should not be used for load-bearing applications. Marine PVC is perfect for wood trim replacement, instrument panels and consoles, and even as an economical alternative to cabinets. ColorCore® offers the same great features as our marine HDPE but has a separate color core that can be exposed through engraving or cutting. ColorCore® is environmentally and UV stabilized to withstand even the harshest outdoor marine conditions and can be used in areas that are washed often or regularly exposed to moisture. HDPE ColorCore® can be fabricated using common woodworking tools and techniques. ColorCore® is available in several gauges and a rainbow of matched colors. If you do not see the color pair you want, give us a call to find out about custom runs! High quality flexible marine grade polycarbonate. Marine grade flexible polycarbonate for extreme conditions. AR2 can be bent at a thickness of 0.060" for marine applications. Marine Board in black for marine applications. Marine Board in dolphin gray for marine applications. Marine Board in sandshade for marine applications. Marine Board in light gray for marine applications. Marine Board in sea-foam (off white) for marine applications. Marine Board in white for marine applications. Black King Starboard withstands the rigors of harsh outdoor marine environments. Dolphin Gray King Starboard withstands the rigors of harsh outdoor marine environments. Sandshade King Starboard withstands the rigors of harsh outdoor marine environments. Light Gray King Starboard withstands the rigors of harsh outdoor marine environments. Seafoam colored King Starboard withstands the rigors of harsh outdoor marine environments. White King Starboard withstands the rigors of harsh outdoor marine environments. Black Marine Board XL is a lighter, economical version of Marine Board. Dolphin gray King Starboard XL is a lighter, economical version of King Starboard. White King Starboard XL is a lighter, economical version of King Starboard. Black King Starlite XL Utility is a lightweight marine substrate utility sheet. Dolphin gray King Starlite XL Utility is a lightweight marine substrate utility sheet. White King Starlite XL Utility is a lightweight marine substrate utility sheet. Final-step polish for acrylic, polycarbonate and other painted and shiny surfaces.